Tires are one of the most fascinating aspects of the bicycle. They can make or break the comfort and efficiency of the ride. 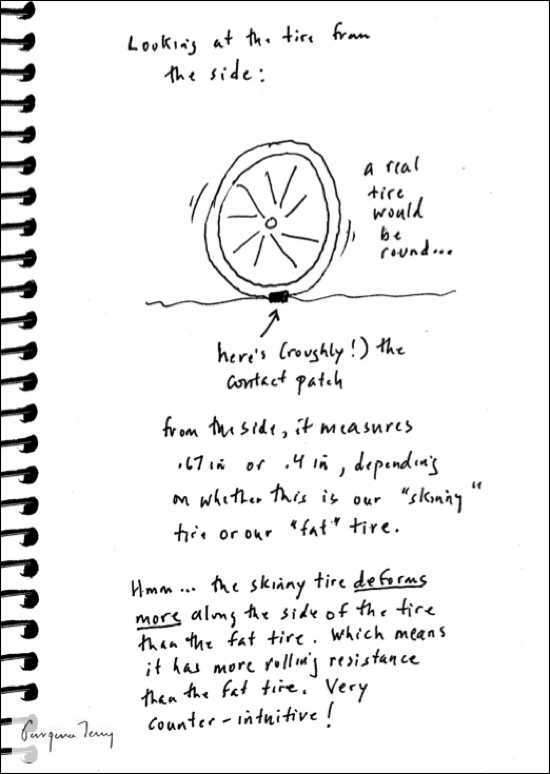 Common sense used to have it that the narrower the tire was and the higher the pressure in the tire, the lower the bicycle tire rolling resistance would be. Which led us all to run the narrowest tires we could find with the pressure pumped to the max. Assuming you were riding on roads as smooth as glass, that might have made sense. Now, some people really don’t want to give up their narrow tires for wider ones. I mean, it just wouldn’t look cool. So, the makers of bicycle rims have come to the rescue — they are now making wider rims! This allows the tire to “relax” (as in, “aahh, that feels better”), which makes the contact patch shorter and wider, just what’s needed to reduce rolling resistance. Another source of rolling resistance comes from rough road surfaces. With the pressure pumped up to the max, the bike bumps around and its forward motion is hindered. Solution: lower the tire pressure so the tire works as a shock absorber, reducing these “suspension losses”. Jan Heine has a neat blog about some testing he did to find out how much more power a cyclist exerts to overcome the bumps. The Gale Force bicycle uses Velocity’s A23 rim for just this reason. With a wider rim like this, not only is the contact patch optimized, but the tire can be run at a lower pressure so it absorbs road shock. 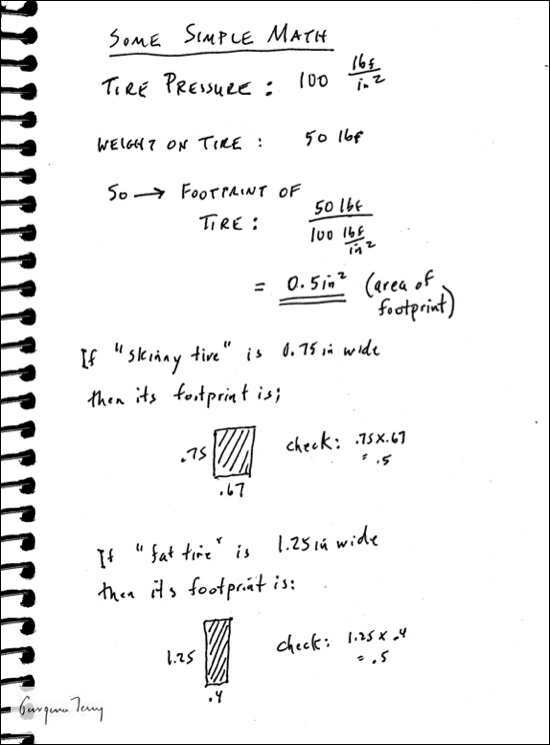 This is because the tire’s sidewalls don’t distort as much as they would with a narrower rim, hence, the tire is a little “taller” and less prone to pinch flats.